We appreciate your feedback about your support experience with WooCommerce, developers of Arcade. This helps us maintain high standards on the WooMarketplace, and helps WooCommerce improve. 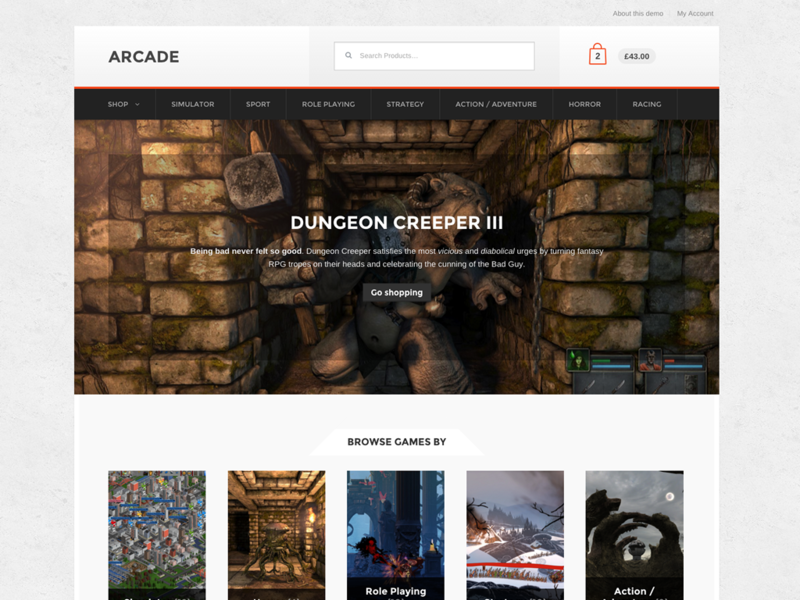 Upgrade your video game shops look and feel with Arcade. It’s bold and modern design will engage visitors and the unique homepage layout will present them with a variety of products as soon as they hit your homepage. Arcade is a Storefront child theme featuring a design that has taken inspiration from a variety of game and tech stores all around the web. It’s bold and modern, and includes a unique homepage layout designed specifically to showcase a wide range of products in a digestible format. Arcade is built on the robust Storefront core parent theme that you know and love. This means you’ll always enjoy 100% compatibility with the latest versions of WooCommerce and various customer-facing WooCommerce extensions. Have bigger ambitions? Install Storefront Mega Menus and take your Arcade-powered online shop to the next level instantly, no cheat codes required.